Everyone wants to have a celebrity-worthy smile; one that shines brighter than the camera lights. Unfortunately, not everyone has one. At Ria Family Dental, we can help. A brighter smile is within your reach with our teeth whitening options. Get your brighter smile today! Your teeth are exposed to different things everyday, many of which can affect them. Keeping your teeth bright and glowing can be very challenging. Knowing the common culprits of staining and darkening is the first step to keeping your teeth bright. The following are the common causes of tooth discolouration. If attended to immediately, most causes of tooth disclouration can be reversed with proper oral hygiene and regular dental scale and cleans. 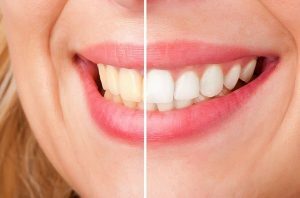 If neglected, the stains can harden requiring teeth whitening to remove. Teeth whitening is a non-invasive, simple, and effective dental procedure that works to improve the shade of your teeth to amplify the beauty of your smile. Ideal candidates can expect a failsafe and effective procedure with the help of the right clinician. Hence we recommend a checkup/ consult before the procedure. Teeth whitening has a number of benefits. In fact, a recent study from the universities of Leeds and Central Lancashire confirms that a brighter smile makes a person more attractive. At Ria Family Dental, we have in-office teeth and home teeth whitening options for our patients. Your dentist will discuss each option with and help you choose what’s best for you.